Dyshidrotic eczema, or dyshidrosis, is a skin condition in which blisters develop on the soles of your feet and the palms of your hands. Blisters are often itchy. Blisters develop on the soles of your feet and the palms of your hands. The blisters are usually itchy and may be filled with fluid. Blisters normally last for about two to four weeks and may be related to seasonal allergies or stress. Your health care provider may be able to diagnose this condition by looking at your skin. A skin biopsy may be needed to rule out other causes, such as a fungal infection. There is no cure. Dyshidrotic eczema normally goes away without problems, but symptoms may come back. 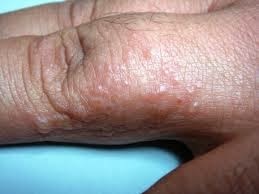 Excess scratching may lead to thick, irritated skin. This makes the problem harder to treat.